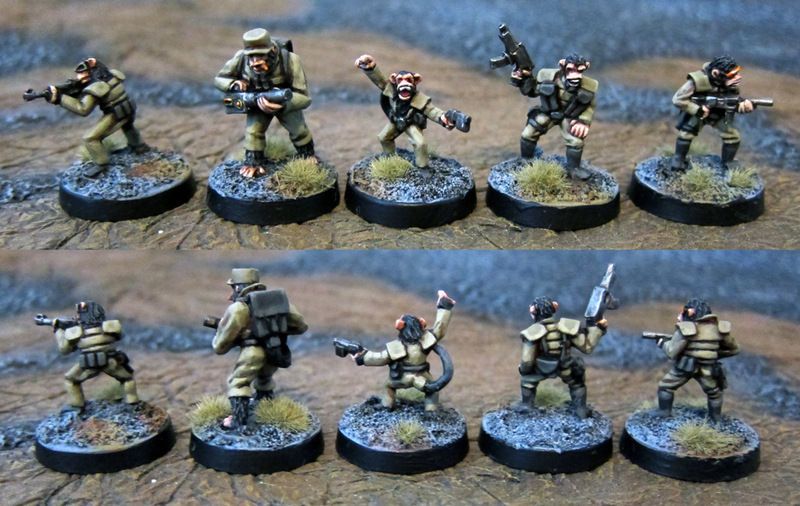 Highlander studios does some great 15mm minis. Some of which are for 5150... And some of those are these "Zhu Zhu's" or monkey-boys. These minis make a terrific little skirmish squad and have really grown on me. "Laugh while you can, monkey boy!" I finished these recently, after having them half-painted for a long time... A bad habit of mine. These minis are deceptively complex sculpts, so once I got past the base color stage, I put them aside until I had time to highlight all the various folds and bits. The uniforms are Vallejo Khaki, with Citadel Charadon Granite gear. The guns are simple boltgun metal with an earthshade wash. It's that time again, when Blog awards make the rounds, helping to promote fellow bloggers and their efforts. The very talented Jay, from Jay's Miniature Enterprises has nominated me for a Liebster Award. Having a look at what this means, I am bound to link back to his blog (which is excellent) and then to 5 other quality blogs that I think need to get more eyeballs on them, as they have less than 200 followers. Now... Technically this makes TSS ineligible, as I just checked and have 350 followers, but I'm not going to allow that to stop me from recommending some fine blogs all the same! I haven't checked the number of followers they have, as by this point I don't think it matters... I've gone rogue here after all. These are just blogs that I think you will enjoy if you read TSS, and it hasn't hurt that they are all frequent commenters. Blogging is a great way to make friends around the world if you cant get around a game table! Fjodin posts regularly (much more regularly than me!) 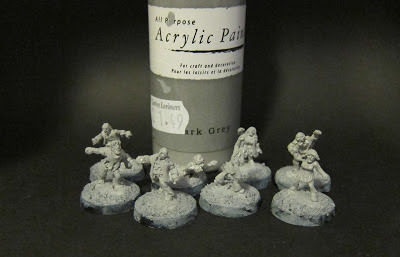 and always has a good mix of bright and crisp painted figures and clever terrain ideas. 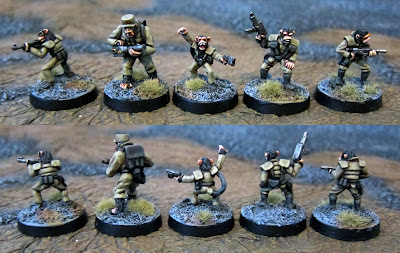 He's a huge fan of Gruntz and is always coming up with something cool! Blacksmith games predominantly in smaller scales, and is always trying out new game ideas.. Many of them solo. His most interesting games lately have been Two Hour Wargames reaction system adapted to space combat... In particular, the Kilrathi wars of the Wing Commander PC games. Brilliant! JF is a legend amongst solo gamers. His solo adaptation of Heroclix has entertained many, not just for it's usefulness but it's also at times a hilarious read! A huge resource for the solo gamer, I'm sure you will find something useful if you have a look around. The most eclectic blog on this list. Mik covers mini gaming, Lego, board gaming, cooking, popular culture, comic books, gardening and even has regular guest spots. Through this site and by listening to the excellent podcast (Minions of the monster master) his group puts out, I have learned so much in the last 2 years, and really got back to my geeky roots. A great painter, gamer and blogger. Lead Addict has a broad range of interests covering several different scales and genres. He is lucky enough to have a very active gaming group (the basement generals) and has a lot of interesting thoughts about the hobby. But seriously folks, this is just a smattering. If you have a click around my "Blog Buddies" list over on the lower right of the page, you can't go wrong... It's all good! Thank you once again Jay, it's always great to hear from you, and may you continue surprising and delighting us as we model our way through the years! I have a huge bunch of stuff to paint for Khurasan and difficult circumstances at home, but in between all this I put my efforts into small bits of scenery to enhance my games. 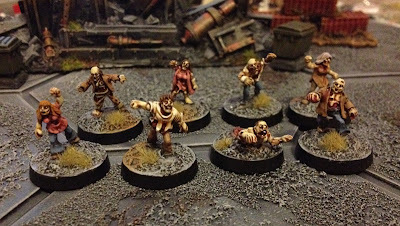 First off, here are some zombies coming out of body bags from TheScene! I am using these as Zombie spawn points or destruction objective markers. I didn't want to paint them black, as I have so many dark models and scenery pieces, so I went with gunship green and gave them a very harsh highlight pass to try to make them look shiny. The hatch is from GZG and is basically an objective, but could be used in countless ways. Here are some GZG doors mounted on plastic card bases, with cork tile backing. They have been built to place up against a flat wall, or on the board edge to represent an entry point. They will be useful as objectives themselves, or to make a building out of any other solid mass scenery. 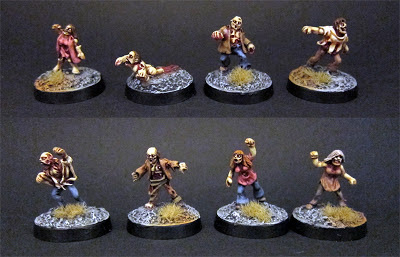 I recently painted up the first 8 of my Khurasan miniatures zombies. These are really nice, animated looking zombies in modern clothes. The clothing is nondescript enough that you could use them for pretty much any period without trouble. In a break from tradition, I remembered to take some pictures as I worked this time, as I was trying a new method of painting again. This was something of an experiment, but I'm happy with the (very fast) results. I used some very cheap light grey hobby acrylic to undercoat these minis. I more commonly use black as an undercoat, and I think that would work well for these figures, but I wanted to try a faster wash based method. I painted on all the color areas at once. 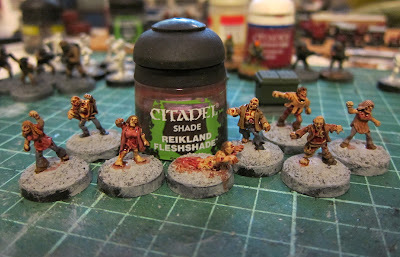 The key thing here is Citadel Rotting Flesh for the zombie skin. They don't look like much at this stage. Also note that I used quite light colors in general. I hit them all over with Reikland Fleshshade. Ogryn flesh wash would work well also, but I was saving that for the gore areas. Up to this point I'd spent about 2 hours. I left them overnight for the washes to dry properly. 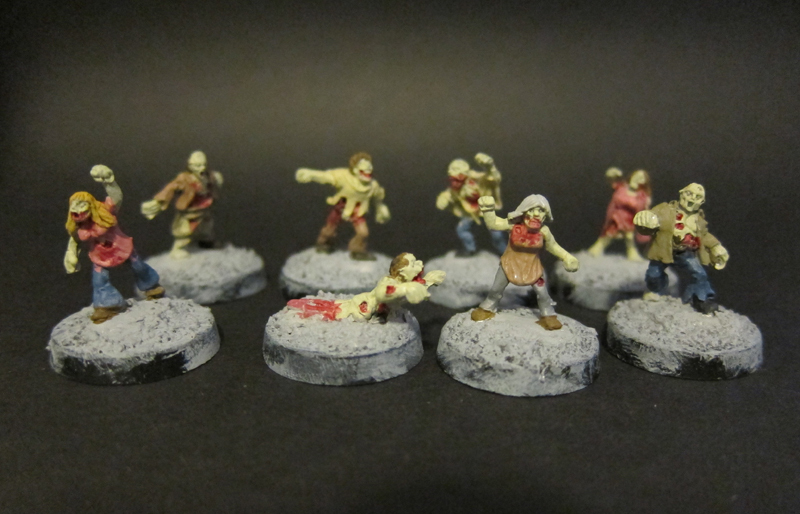 I went back and highlighted the zombies with the original colors, then a second highlight with a little bone color mixed in to lighten them. The eyes got a white dot and when dry, a few areas were pin washed with various colors to define edges of clothes and eye sockets. I washed the bases with Nuln oil, then drybrushed it up to the undercoat color before adding some tufts. All in all, this took about another hour and a half. There were 20 different zombies in the bag, so I still have 12 to go. I think I'll get another batch to the wash stage tonight as I'm too tired for "proper" painting... Although I might prep some survivors. I am very impressed with these zombie sculpts... I'd say they are about the best on the market for 15mm at the moment. Now I'll have to strip my old Zeds to match the flesh tone. Grrr. I recently completed these guys from GZG. They complete my little set of criminal gangers, useful as enemies for a variety of forces. 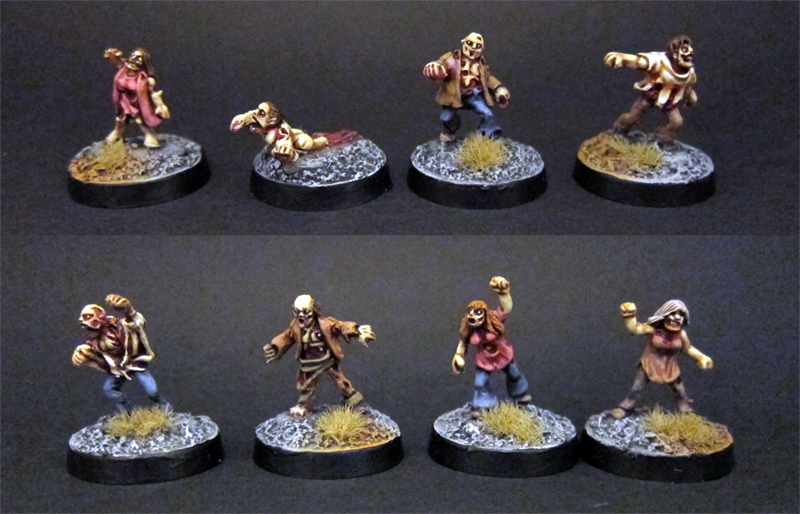 Some great poses and character in these versatile minis. The color palette is limited to tie them together, and they didn't take long to finish using some simple wash and highlight techniques. Here they are with the ones I already have painted. I still haven't had the time for a game as things are a bit difficult at home right now, but that's the way it goes.